Over the past year more than 80,000 hoteliers and 350+ vendors from the world's leading brands across more than 50 countries have joined together on Hotel Tech Report to collaborate, share insights and foster transparency to speed up the pace of global innovation in our industry (and work together to make sure those pesky home sharing platforms and OTAs don't out innovate us all). Vendors: I'm looking to grow our team, do you know anyone with hotel industry experience and a strong network that might be a good fit for X role? Hoteliers: I have a strong background and network in hospitality but want to leverage my skills into a career in tech. Do you know which companies are hiring? So...we're introducing Hotel Tech Report Jobs to help hoteliers and techies looking to leverage their industry experience into finding their next big opportunity in hotel tech. 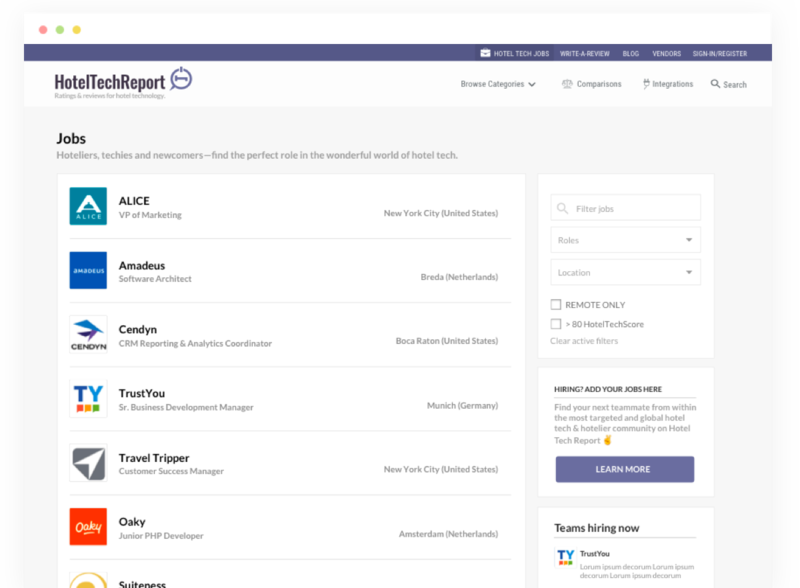 Save time constantly scanning the web for open opportunities and keep a pulse on what's out there by browsing hundreds of open positions at top travel tech firms around the globe, filter by role or city, find remote jobs and more. Need some inspiration? Check out the 2018 10 Best Places to Work in Hotel Tech and find out what their employees love about them. Let the match making begin! Work for a hotel tech company?